It started with a casual suggestion: Bing Bong’s sacrifice is a model of substitutionary atonement. Substitutionary atonement is one understanding of what happens at the crucifixion of Jesus. This understanding says something like: humanity is sinful/behaved wrongly/is bad, so God is angry with humanity and demands that they be punished and God be “satisfied.” Apparently, the way to satisfy God is with blood and suffering and death of an innocent. So God sends Jesus to satisfy God (the economics of such a transaction baffles me). Jesus suffers in place of you or me or humanity as a whole, which somehow makes things a-okay with God. It’s obviously not my favorite way of understanding the atonement. Truthfully, it isn’t a beloved atonement model in many Christian circles as it fundamentally relies on an abusive understanding of God, then acts as though a benevolent victim Son makes up for the violently abusive Father as though that doesn’t pose problems for trinitarian unity. All that to say: When a student casually made this suggestion in the school Commons area, it couldn’t go unaddressed. We love Bing Bong, we cried at his memory-dump fade-away death. Certainly he wouldn’t be representing something that’s so problematic. … Right? But the seeds of doubt and uncertainty were clearly planted, and an increasingly heated conversation followed. I maintain that Bing Bong may be a model of Christ (and maybe a great way to talk to kids and adolescents about Christ), but that he is not a model of substitutionary atonement. There’s no angry third-party involved; the only third-party is Riley, the being they live and move within and for whom they want to do what’s best (which could make Riley into a God-figure, in this one way alone). But Riley isn’t angry and demanding the pain and death of one of the beings inside her. Riley doesn’t need to be “satisfied.” So Bing Bong isn’t substituting himself for Joy’s wrongs; he’s simply doing what is best for Riley — Joy has very little part in his decision at all — and it’s not about paying any kind of debt or covering over wrongdoing. Which is when another student jumps in and says: There is a kind of debt and wrongdoing, at least in Joy’s emotional experience. Joy feels responsible for their circumstances, feels responsible for getting Sadness back safely, and feels responsible for Riley’s overall well-being. It’s the emotional “debt” of her guilt that Bing Bong pays. 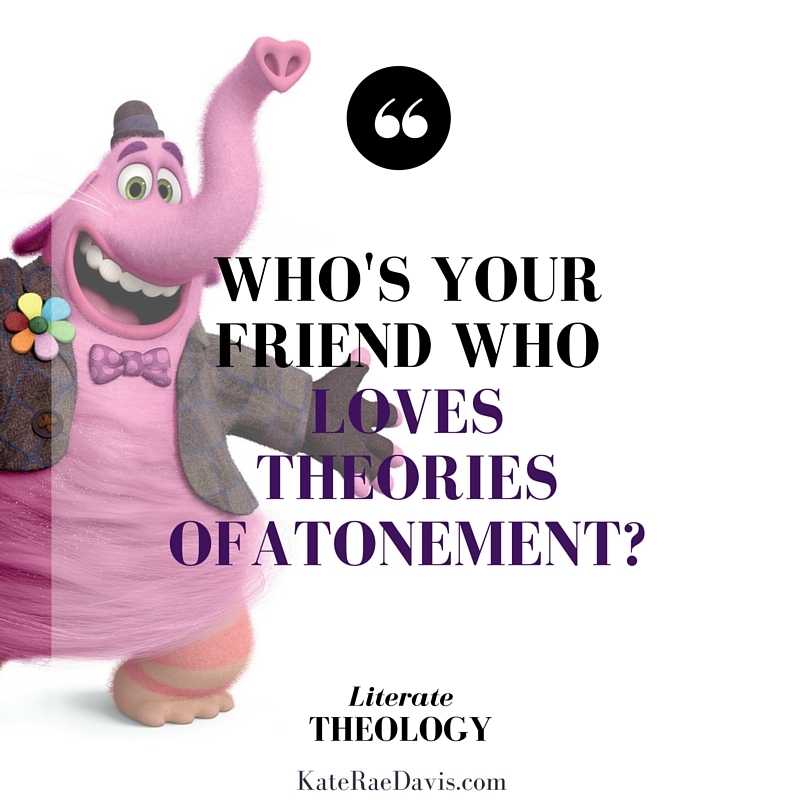 So if he’s a Christ figure, it is a model of substitutionary atonement. And then another student: Why is this even a question? Bing Bong isn’t like Jesus in any other way, so he’s not a Christ figure. We never came to a conclusion. Is Bing Bong Christ-like in any way? Not at all? Does Bing Bong point us, in some way, to Christ? Does Bing Bong’s sacrificial death conform to the pattern of Christ’s death? What is it that pulls at our heartstrings, if not Christ? Are we just a group of people who take Pixar movies way too seriously? Tell us what YOU think about Bing Bong! Weigh in below in the comments. Maybe together we can come to some kind of understanding.